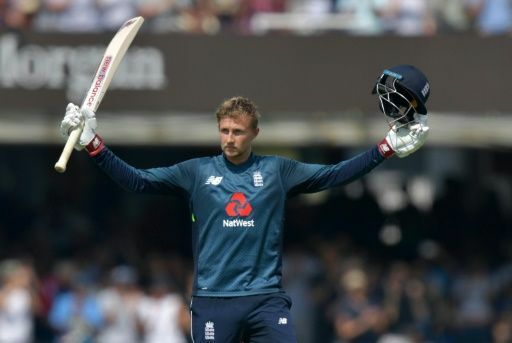 Joe Root's century allied to fifties from captain Eoin Morgan and David Willey helped England to a total of 322 for seven against India in the second one-day international at Lord's on Saturday. It was a significantly improved effort after the hosts were dismissed for 268 in India's eight-wicket win in the series opener at Trent Bridge on Thursday. That match saw India left-arm wrist-spinner Kuldeep Yadav take a stunning six for 25. When Yadav struck with the second ball of his first over at Lord's, as he had done in Nottingham, England fans in a capacity crowd at the "home of cricket" might have feared the worst. But this time the spinner did not run through the top order, although Kuldeep still finished with the good figures of three for 68 in a match where another India win would see them take an unbeatable 2-0 lead in the three-match series. England made a brisk start, with Jonny Bairstow in fine touch. But, as at Nottingham, he was out for 38 as Kuldeep once more took a wicket after coming on in the 11th over. This time Bairstow was unlucky to see the ball deflect off both his pad and the back of his bat before hitting the stumps. Fellow opener Jason Roy (40) also fell to Kuldeep when he slog-swept straight to Umesh Yadav at deep midwicket. Kuldeep had taken two wickets for nine runs in 12 balls and England were 86 for two. Test skipper Root and white-ball captain Morgan, who won the toss, were understandably cautious against Kuldeep as they looked to attack the other bowlers instead. Root completed a 56-ball fifty and Morgan followed him to the landmark in 49 balls. But left-hander Morgan failed to press on, falling for 53 when he hit a Kuldeep full toss to Shikhar Dhawan at deep midwicket to end a third-wicket stand of 103. Middle-order dangermen Ben Stokes (five) and Jos Buttler (four) then managed just nine runs between them. Stokes carelessly tried to guide a Hardik Pandya cutter to the third man but succeeded only in guiding it straight to wicket-keeper MS Dhoni. Buttler was also caught behind after flat-footedly cutting at Umesh Yadav. Root, however, held firm, completing a 109-ball century and then hoisting Pandya for a six over midwicket. England's top-order strength means Willey has not had many chances to showcase his batting ability at international level. But the powerful left-hander, the son of former England batsman David Willey, took his opportunity on Saturday with a quickfire maiden ODI fifty off 30 balls including five fours and a six. Willey hit 50 and helped Root add 83 for the seventh wicket before the Test captain was run out for 113 by Dhoni's direct hit off the last ball of the innings.